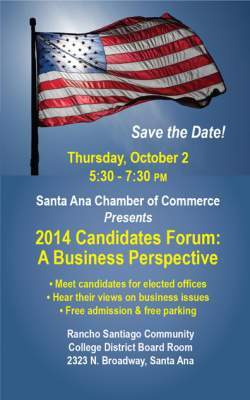 The Santa Ana Chamber of Commerce is hosting a Santa Ana Candidates Forum this evening, Oct. 2, 2014, at the Rancho Santiago Community College District, in their Board Room, locatd at 2323 N. Broadway, Ste. 410, in Santa Ana, from 5:30 pm to 7:30 pm. Call 714-541-5353 if you have any questions. 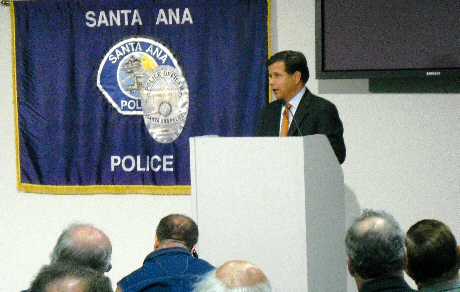 SANTA ANA, CA (June 19, 2012) – Santa Ana Mayor Miguel Pulido will once again deliver the annual “State of the City” address at a breakfast scheduled for Wednesday, June 20th, at 7:30 am, at the Bowers Museum.